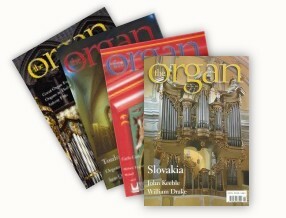 Subscribers to The Organ receive four full-colour issues of The Organ every year. A subscription to The Organ also makes an ideal gift. To receive a complimentary copy with no obligation to subscribe, please send us your name and address. UK Student rate £14 Available to undergraduate students in the United Kingdom only, on proof of student status. You can now subscribe online at the Musical Opinion site. To subscribe to The Organ, simply go to the Musical Opinion subscriptions page and click on the appropriate button. You can pay by Visa, Mastercard, JCB, Switch, Solo, and Visa Electron, and all information is entered on a fully secure web page provided by Worldpay. There is no extra charge for paying online, and for overseas subscriptions your card issuer will convert the amount into your local currency at their current rate, so there is no need to worry about different currencies. Any queries regarding subscriptions should be send to subscriptions@theorganmag.com. If you want to use the online subscription method to renew your subscription, please do so but send us an email at the address above with your details and subscriber number so that we can tie the two together.